In an education system that is predominately classroom based and focuses on the curriculum and results, Forest School provides an amazing opportunity to take learning outside. The individual can develop vital skills that are needed throughout life: resilience, communication and teamwork. The most important aspect driving the Forest School experience is that it is fun and engaging for the learner. Once this is in place, Forest School can provide a platform for both children and adults to learn more about themselves, about each other and about the world we live in. It is important to note that in Forest School sessions we are more concerned with the ideas of self-esteem and self-worth, with the aim of boosting a child’s emotional intelligence. We believe every individual can achieve what they want when they are provided with a safe, nurturing and engaging learning environment. St Monica’s Catholic Primary School aims to use its natural outdoor woodland area to offer the children an insight into the Forest School ethos. This approach to outdoor learning encourages children to become independent, use their imagination, take appropriate risks within boundaries and initiate learning for themselves. Forest School offers a holistic approach, incorporating children’s individuality and develops their skills for lifelong learning. Forest School explores the outdoors and the natural environment with practical, useful activities, building upon emotional and spiritual aspects of learning where self-esteem and self-confidence can grow and positive relationships with peers can be formed. The school’s five universal aims of the Child Protection Policy are also key objectives in the Forest School ethos. Be healthy: Forest School sessions offer the chance for children to become physically, mentally and emotionally healthier. Make a positive contribution: Lessons include methods for developing positive relationships, self-confidence and a feeling of self-worth. Enjoy and achieve: It is important that the child enjoys all Forest School sessions as high levels of engagement are key to learning. Stay safe: Safety is paramount, sites used for Forest School sessions are within the school grounds and are checked before activities commence. Risk assessments for the site and activities are completed, there are separate policies for working with fires and tools. Achieve economic well-being: Forest Schools aim to equip the children with the tools needed for adult life through increased communication, effectively working with peers and building up a feeling of independence. St Monica’s School aims to provide the foundations to enable our children to achieve their full potential, spiritually, morally, academically, physically and socially and to become responsible young people. Forest School is another way of delivering these aims outside of the classroom setting as it provides a stimulating environment where children have access to greater resources and learning opportunities. Teaching and learning must underpin every successful Forest School session, St Monica’s has two Level 3 Forest School Practitioners one of whom is always present every session. Effective teaching is modelled through a variety of teaching methods and aims to develop good relationships and communication between all pupils. All Forest School sessions will be conducted in a safe and controlled environment where, in accordance with the school’s behavior policy, good behaviour is actively encouraged and reinforced, developing self-esteem and self-discipline. Clear rules and guidelines will be stated at the start of the session and each child must agree to follow them before the activities begin. One of the principles of Forest School is to promote environmental awareness and encourage sustainability. The children are taught about respect and responsibility for the world around them. Both the children and adults are encouraged to respect their environment and to be aware of conservation issues of the woodland around them. The aim is to promote respect for wildlife, which will be achieved through detailed session plans, evaluation and reference to our woodland management plan and ecological impact assessment. If appropriate, reclaimed, recycled and sustainable resources will be used to maintain and develop our forest school site. It is extremely important that the children have fun and learn in a suitable environment that is safe to use. St Monica’s Orchard is the site for our Forest School. It is within the school grounds and it is not accessible to the general public. 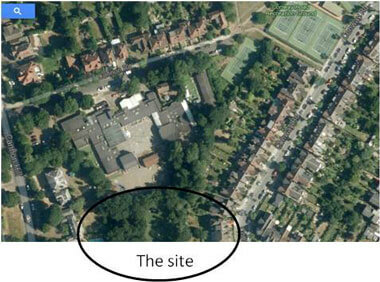 There are risk assessments available for the site that we use, the activities, the use of fires and the use of tools. A Forest School Leader will carry out risk assessments at the beginning of each term which will take account of seasonal change. In addition a daily risk assessment will be undertaken before each forest school session. Children should bring in spare / old clothes when the teacher instructs the class. Jogging bottoms, long sleeved t-shirts or jumpers and a waterproof jacket are all advised. Forest School sessions still go ahead in cold and light rain so it is essential the children and adults are dressed appropriately. Children who do not have correct clothing may not be allowed to take part in activities. As previously said, sessions will continue if the weather allows and the Forest School leader will always visit the site the day of the session. Heavy rain, cold temperatures and strong winds may risk the child’s safety and in these conditions, Forest School would not go ahead. The maximum number of children taking part in Forest School at any one time is 15 in Key Stage 1 and 30 in Key Stage 2, a Level 3 Forest School Practitioner will be present on all sessions – parent volunteers may join the group if agreed by the school. All Forest School leaders are first aid trained, the medical room staff are also notified before each session and are available to reach by phone. The journey from the medical room to the site is 2-3 minutes and children go in pairs went travelling between the two. Children (one year group each term), will visit the school’s orchard as a class/group for a two hour Forest School session every week. They will have the chance to explore, work as a team, take risks and learn to respect our surroundings. Risk assessments for the site and for activities are updated termly and a survey of the area is carried out on the day of session. There are separate procedures when using fire or working with tools. All members of staff at St Monica’s Catholic Primary School undertake Child Protection training and everyone involved in Forest School is fully briefed on health and safety and showed risk assessment of sites and activities. 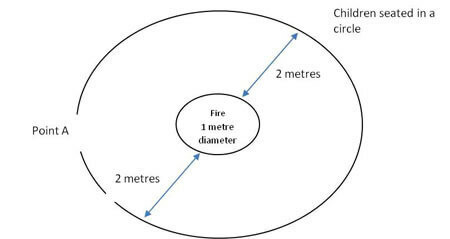 Fires and tool use will only occur when a Level 3 Forest School Practitioner is present. Ensure all clothing and hair is tied back before sessions start, especially when working with fire. Always have a bucket of water and first aid kit present – including burns kit. Enter fire circle from point A, walking around the outside of the logs, children to step over the logs and sit. Only four children are allowed into the central fire area at a time. Children must stay on one knee when bending down. Fire-proof gloves must be worn when the hand is going near naked flames. Children are not allowed to cross the circle or step into the circle at any time. Chosen area must be clear of overhanging branches and the floor must be relatively clear of debris. Individual fires must be at least 5 meters away from other fires and a water bucket and first aid kit must always be present. Always have water bucket and first aid, including burns kit. Always stay with the kettle. Always place the kettle on a flat surface. For Kelly kettles, have air hole on opposite side to spout and keep spout opposite yourself. Remember to remove the cork when putting on fire. Have fire gloves readily available and when the kettle boils remove base with gloves. It is best to allow the fire to go out naturally. However, if you cannot, pour water on it. If there is a lot of smoke, wait, and then pour a little bit more on and repeat until out. Pour water slowly until it stops smoking and hissing. Use a shovel to stir fire making sure it is out. Add more water if needed. Soil should be fine to touch when fire is completely out. The procedures for sharpening and maintaining tools are found in the forest school handbook. Extremely clear guidelines are set out at the start of each session over the use of tools; anyone found not following the rules will not take part in the activity. The ‘tool talk’ used for the ensuring of safe use are also found in the Forest School handbook. Children will only use the tools under close adult supervision and an inventory is checked at the end of each session. Individuals will collect and safely dispose of any food waste they create themselves, regardless of whether or not it is biodegradable. There will be two bins on site, one for food waste and another for general waste products. At the start of each session two children are picked to monitor the safe disposal of food and litter. The overall responsibility will lie with the class teacher / Forest School Leader. Food must only be eaten when an arranged time and location has been set, in order to cut down on the environmental impact on the area. School toilets are easily accessible to the children throughout sessions. Firstly, assess the injury, severity, danger, seriousness etc. Forest school leader to administer first aid to the casualty on site or child goes to the medical room, where they have already been notified of the session. If the child cannot reach the medical room, Forest School leader to phone and they will come to the forest. Ensure the safety of the remainder of the group. Alert emergency services if necessary. Contact the parents, numbers on consent form in kit bag. Seek further aid if required. Note all incidents in the accident book stored in the medical room. Administration of first aid and responsibility of the first aid kit, write ups in accident book, mobile phone present at all times. Transport does not play a role as our Forest School location is on school grounds, if the need for an ambulance did arise they have access through the side gate up to the entrance for Forest School. © Copyright 2019 St Monica's Catholic Primary School. All rights reserved.